Gliding very low over the open sea or along cliff tops on straight wings, the Fulmar is a familiar species around the coast of Arran. Superficially gull like, it has a “tube nose” more closely related to albatrosses. On many of the cliffs around the coast of Arran there are small breeding colonies. 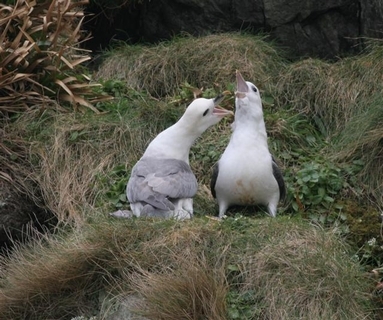 Fulmar is a long lived species with some individuals living for more than forty years. They normally start breeding at around ten to twelve years old. Many Fulmars return during the day to their breeding cliffs as early as November and most birds have claimed their nesting ledge by January. A single egg is laid in early to mid May. Males and females share the long incubation of around fifty days, taking it in turns of around five days. Chicks hatch in late June but it takes almost another fifty days before they are fledged and depart the cliffs in late August or September. Fulmar chicks have at least one adult with them for the first ten to fifteen days after hatching. After that both parents forage for food leaving the chick alone. Although with this technique the chicks can grow rapidly, they are vulnerable to mammal predators like rats and mink and that may be a problem in Arran. In 2009 although Arran had a number of occupied colonies, there were no reports of fledged young from any of the widespread colonies. This summer I would be interested in any reports of sightings of Fulmar young in nests. Cliff colonies should be watched at a distance using binoculars or a telescope to avoid any possible disturbance of the nesting birds.